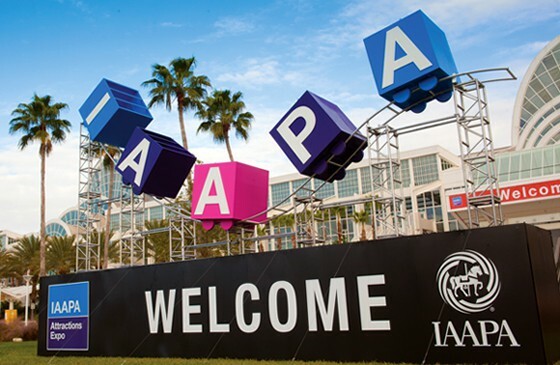 Each year the IAAPA Attractions Expo takes place in sunny Orlando, Florida. The IAAPA Attractions Expo is the largest international trade show for the amusements and attractions industry. It features 1,000+ exhibitors and more than 28,000 attendees from across the globe. This year’s event will take place in November at the Orange County Convention Center. The IAAPA Attractions expo allows attendees to learn from distinguished leaders, exchange ideas and proven solutions with peers and to gain product/services insight from the Expo floor that will help you improve your business. Considered more of an experience than an exposition, the IAAPA Attractions Expo is five days of wall-to-wall activity and opportunities vital to your success within the industry. Ensure your stand makes a bang by using a professional company like John Gibson Displays for it, this will bring more people to your stand. There are new discoveries, operations improvements, management events, and potential partnerships around every corner. Meet, greet, and network with people ready to make an impact on your business. If you’re going to be away from home for a convention or expo, you might as well go somewhere where you can bring your family and work a family vacation into your plans. Conventions in Orlando, FL offer a chance for attendees to enjoy a city that offers plenty of fun and entertainment for the whole family. The Orange County Convention Center is literally within miles of Disney World, Sea World and Universal Studios. The Orange County Convention Center (the second largest convention center in the United States) is the crown jewel of Florida’s convention, trade show and exhibition industry. The center is owned by the Orange County Government and is located in the heart of the area’s tourist attractions. The Orange County Convention Center is a state of the art, large-sized convention center that is large enough to host the PGA Merchandise Show. The Orange County Convention Center offers 7,000,000 sq.ft. of total space with 2,100,000 of exhibit space. That is a lot of area to hold your convention, trade show or exhibit! Metro Exhibits has been a proud supplier of a wide range of services for exhibitors and companies who participate in the IAAPA Attractions Expo. For more information on Orlando, Florida or on the Orange County Convention Center, please click on the appropriate link. Minutes away from the Orlando International Airport (with immediate access to a number of world-class accommodations) The Orange County Convention Center located in the heart of Orlando’s tourist area. Any guest with a family (or a nostalgic childhood), will most likely know the major attractions of the Orlando Area: Disney World, Sea World and Universal Studios. Metro Exhibits provides white-glove, concierge level trade show services for businesses and organizations who are involved with the IAAPA Attractions Expo and other trade shows, expos, and conventions. If you are an event organizer or business, Metro Exhibits provides a wide range of services that will meet any need including trade show display design, rental, sales, logistics, installation, and printing. We have 68,700 sq.ft. of manufacturing and storage capabilities throughout the country including in Atlanta, Georgia, New York City, New York, Las Vegas, Nevada, and Orlando, Florida. We make sure that you never have to worry about a single aspect of your trade show experience.